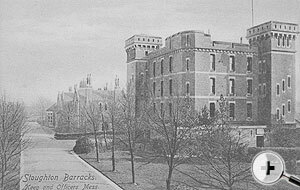 The majority of the Non-Commissioned Officers and Men serving at the Depot were single and were accommodated in the two blocks seen in this photograph. The foremost of these is Peterborough block, named after the first Colonel of the Regiment, Henry Mordaunt (Second) Earl of Peterborough, by whom it was raised and under whom it held its first parade on Putney Heath on 14th October 1661. 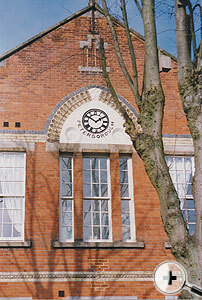 Peterbourough Block and clock c1995. The block behind, a corner of which is only visible, was named Tangier, after the town of Tangier to provide a garrison for which the Regiment was raised in 1661. Tangier is also the British Army’s and the Regiment’s oldest Battle Honour. 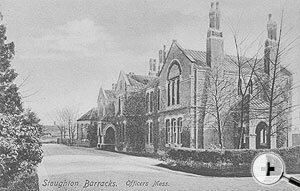 At the time when this photograph was taken, dining halls did not exist and meals were partaken of in the rooms in which the men slept; accommodation for the Sergeants was available in the bunks situated in the centre of each block. 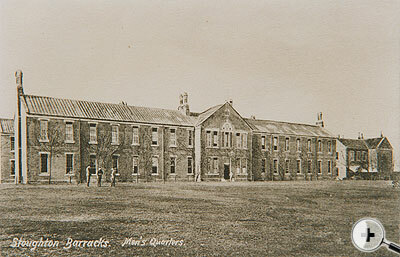 Officers' Mess and Rear of the Keep and Officers' Mess.